Tarun had made banging debut as hero with a musical romantic entertainer film ‘Nuvve Kavali’ and later he got the chocolate and lover boy image for starring in several super hit films. This young hero is making come back to entertain movie buffs with a new film and this news makes his fans excited. Though Tarun took some gap, he is coming up with a fresh love entertainer. As we all know first look and teaser of 'Idi Naa Love Story' were launched recently. Tarun looks pretty graceful in beard will be seen in three different get-ups in the film. Tarun already won accolades for his different look in the posters and teaser. Many predict that he will make grand re-entry by scoring huge hit with 'Idi Naa Love Story'. 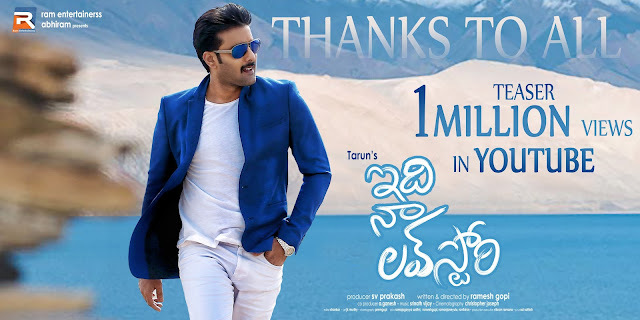 Teaser of the film launched by Nagarjuna has crossed over 10 lakh views. Tarun specially thanked his fans for the support. Concept of the film is how much you love a girl and how far you will go for her. Produced by Sv Prakash and presented by Abhiram under ram entertainerss Banner, Idi Naa Love Story is directed by Ramesh Gopi. Oviya is female lead opposite Tarun in the film that has music by Srinath Vijay.